According to Merriam-Webster, a freedom fighter is defined as a person who takes part in a resistance movement against an oppressive political or social establishment. Time Magazine’s Man of the Year in 1956 was the Hungarian Freedom Fighter. On this day sixty-two years ago, what started as a peaceful, student-led demonstration would quickly become a Revolution that spread across Hungary. Thousands would die fighting for their freedom and 200,000 Hungarians, including many noted intellectuals and artists, would flee as refugees. 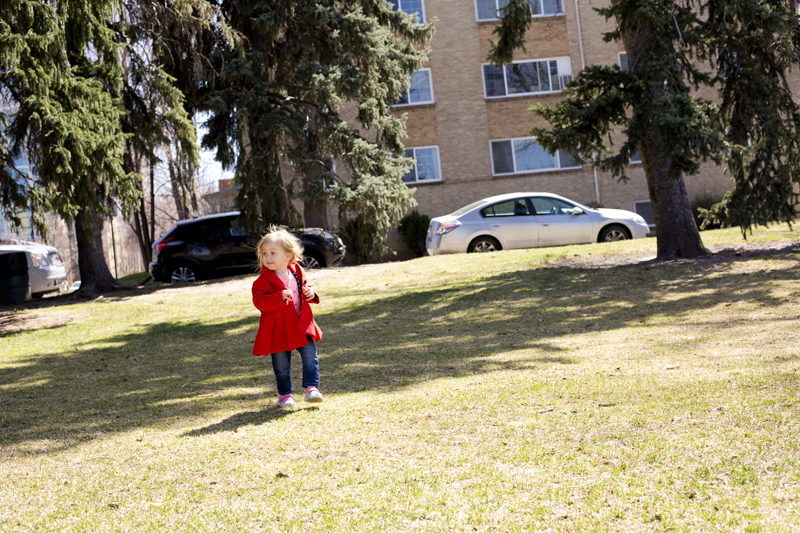 For more than thirty years, public discussion of the revolution would be silenced in Hungary, but that didn’t stop monuments being erected in Hungarian immigrant communities across the globe, including many here in the United States. 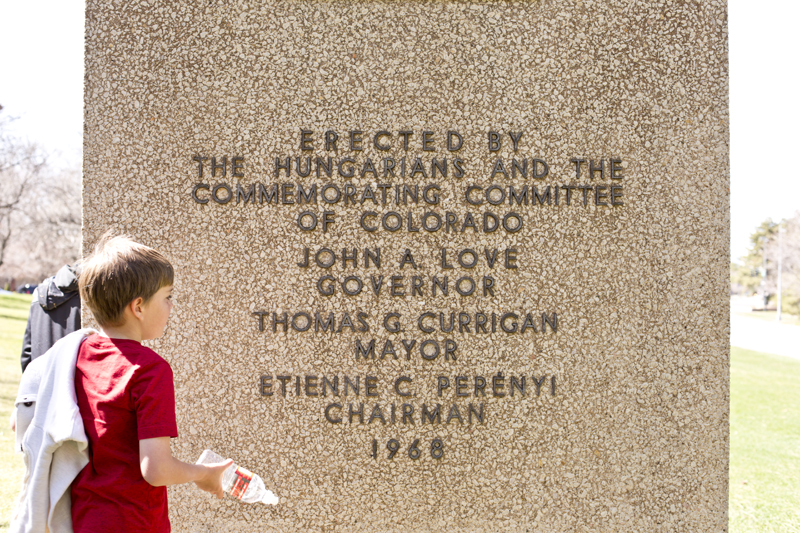 When we were in Denver earlier this year for my grandfather’s funeral, David and I took the kids to visit one of these memorials. 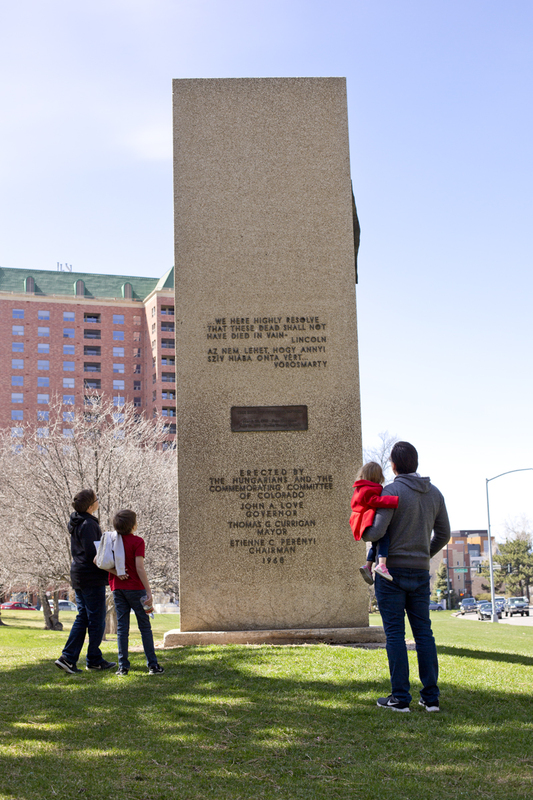 Hungarian Freedom Park is nestled in the heart of Denver. 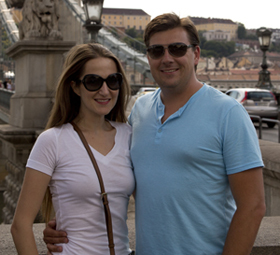 Formerly known as Arlington Park, it was renamed in 1968 to commemorate the Hungarian revolt against Soviet oppression. 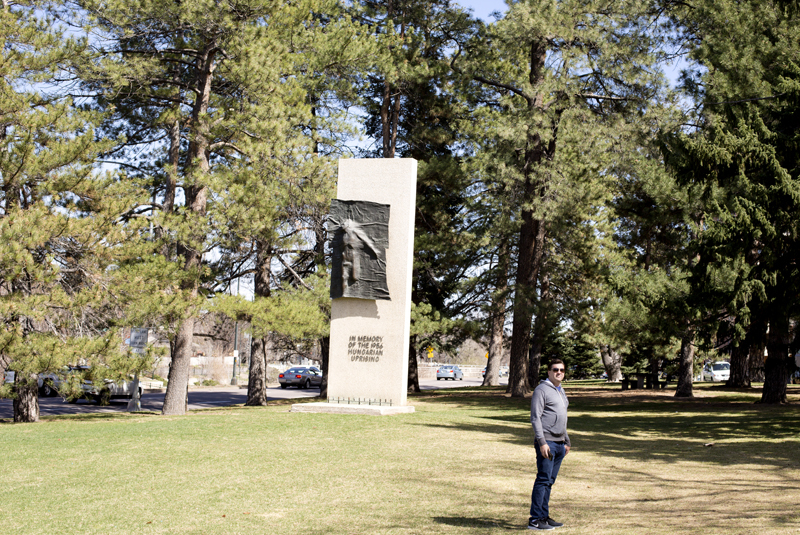 The park is home to a monument, sculpted by Zoltan Popovits, commemorating the 1956 uprising. 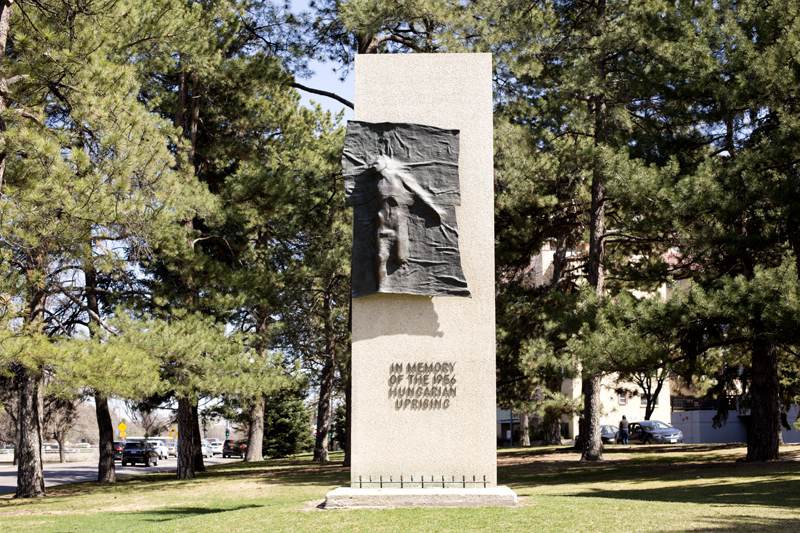 The concrete and bronze sculpture depicts a young man breaking through an iron curtain. On the back of the monument are two quotes. 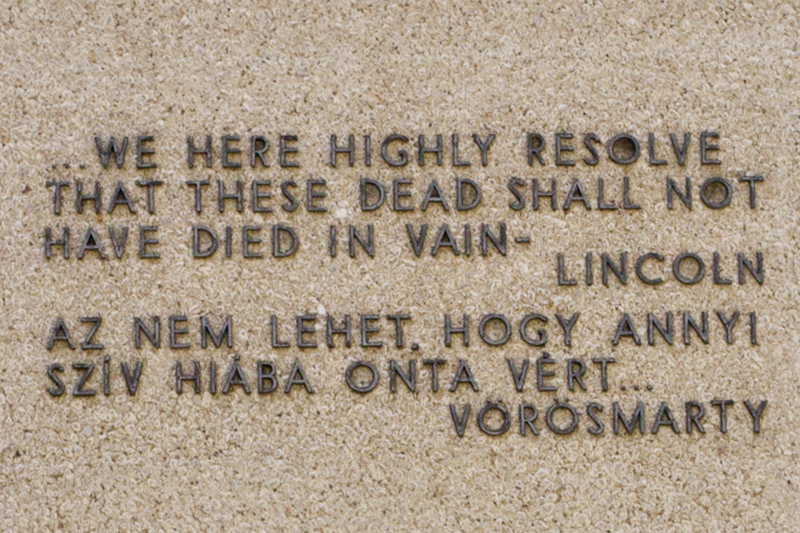 One, from Abraham Lincoln’s Gettysburg Address, reads, “…We here highly resolve that the dead shall not have died in vain.” The other is a line from the famous poem Szózat (Appeal) by Hungarian poet Vörösmarty Mihály. It reads, “Az nem lehet hogy annyi szív. Hiában onta vért” (It cannot be, that so many hearts, Uselessly spilled their blood). Szózat, which was written in 1836, was nearly chosen as the Hungarian national anthem and is still considered a secondary anthem, often being sung at the end of national celebrations. It can be read in its entirety here (they have it in Hungarian, English and lyrical English). Today on Nemzeti ünnep (National Day), we remember those who stood up against oppression knowing that it may cost them their lives (and for many, it did). « Countdown to Halloween: Axl and Slash Forever!